We wish you a healthy, happy and prosperous 2017. We thank our many clients and friends for your continued confidence and belief in the Bernardi team, our processes and the way we approach investing in today’s volatile bond market. The Chinese zodiac designates 2017 as the “Year of the Rooster”. The rooster is the tenth in the twelve year Chinese zodiac cycle. Dawn and awakening, of course, are associated with our barnyard friend. The Chinese assign it confidence and dependability characteristics. The phrase, “rise and shine” is commonly associated with this year’s mascot. And what an apt phrase and bond market metaphor the rooster portrays as we begin 2017! The market has awakened from its stupor of the last several years creating enhanced income earning opportunities for income-oriented bond investors. “Rise and shine”, indeed. 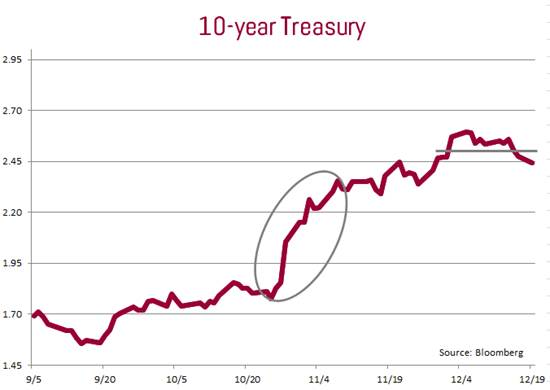 The 10 year taxable U.S. treasury bond began 2016 yielding around 2.30% and ended the year paying 2.45%. Shown below is a 3-month graph of the 10-year, Treasury Note yield. As you can see, the yield spiked immediately after the election as traders and investors adjusted to what a “Trump Presidency” might do to growth and inflation expectations. Recent movement shows a flattening trend-line, albeit at significantly higher yield levels once the initial yield increases occurred. We anticipate this trend-line will hold near current levels in the short term until the market sees some real evidence of economic growth as 2017 unfolds. Municipal bond yields reacted in similar fashion and also made some adjustment to factor in the likelihood of lower income tax rates. Looking ahead, new issue supply in 2017 is expected to be healthy following a very robust new issue supply in 2016. It is important to remember that refunding issues, which made up roughly 40%1 of the market in the past few years, may not be as plentiful in a higher interest rate environment. Supply and demand factors affect municipal yields to a greater extent than they affect Treasury bond yields. Two months ago 20-year, “AA” rated municipal bonds were yielding around 2.70%. Today you can earn a yield to maturity of 3.30%2 on good quality, longer dated issues. This equates to approximately 4.50% for a taxpayer in a 28% federal income tax bracket and a more than 5.00% taxable equivalent for a 35% bracketed taxpayer. Recently, we have seen yields approach, or equal, 4.00% on some issues that are on our approved list of credits. If you have been sitting on cash waiting for higher yields, it may be time to allocate a portion to the market. If economic growth and projections do not materialize as quickly as some expect, rates could easily backtrack. Please contact your Bernardi Securities Investment Specialist to discuss our tactical bond ladder strategy to potentially capitalize on these higher yields as we begin the “ Year of the Rooster”. Again, thank you for your continued confidence.